Nikko Toshogu shrine is one of the high lights in Nikko. Nikko is one of the popular destinations from Tokyo. You can visit there as day trip. Of course if you stay there, you can visit many places in outside of Nikko city and also can enjoy hot springs in Kinugawa Onsen too. There are several ways to get Nikko by train. In this post,I will show you how to get there and compare a few deals. As you see the map above, there are three ways to get Nikko. Trip time is not much different among these choices. But you have to transfer at Utsunomiya station to take Shinkansen + Nikko line route. JR East Pass and Kanto Area Pass cover this route fully too. But direct train to Nikko from Shinjuku is available for these passes too. Please see the next chapter. Both JR East and Tobu Railway operate direct train service “Nikko” from Shinjuku to Nikko and “Kinugawa” to Kinugawa Onsen. This train runs on JR East line and Tobu Railway line. So JR Pass does not cover this train fully. It covers between Shinjuku and Omiya only. But both JR East Pass and Kanto Area Pass covers this train fully even though this train runs on non JR line. Please see the post below to get the details about this train. You can find out the timetable at JR East official site. Limited Express Kegon and Kinu are operated by 100 series. Actually this fleet is much better than JR 253 series. Tobu Railway is more popular to visit Nikko for local tourists. Tobu Railway’s terminal station is Asakusa. Asakusa is not very convenient place for everybody. But trains run more frequently, especially to Kinugawa Onsen. I mentioned only limited express train service above. But Tobu Railway operates Rapid Train service too. These above deals do not include limited express surcharge. You can take Rapid train service without any extra on the pass. Rapid train used to run between Asakusa and Tobu-Nikko/Kinugawa-Onsen directly. However this direct rapid train was discontinued in 2017. If you travel by rapid train, you have to change trains at least once at Minami-Kurihashi. The interior of Rapid train which run between Minami-Kurihashi and Tobu-Nikko, Kinugawa-Onsen. It is not luxury but good enough. If you take Rapid train, trip time is 2.5 hours to get Nikko. It is not very much different from limited express. In Nikko, Tobu-Nikko station is the core place. JR Nikko station is a few minutes away from Tobu-Nikko station. Most of bus services stop at both stations. Please see my post to see more about Nikko stations. Need your advice regarding local train to Nikko. I’m planning to go to Nikko using Nikko all area pass and I want to take local train to Nikko or Rapid Train service as you said. I’ve been searching the schedule for Rapid Train but I can’t find it so maybe can you share the schedule of Rapid Train to Asakusa-Nikko and Nikko Asakusa? Does it run everytime (like every 15 mins)? I’ve looked Hyperpedia and searched to Nikko so I have one more question. One of route says I can ride JR Nikko Line for Nikko from UTSUNOMIYA St. but does it cover with Nikko all area pass? JR Nikko line is not covered. This pass covers only Tobu railway lines. Please refer “Search with some conditions” in the link which I gave you about hyperdia. You may check at “Express”, “Ordinary Train” and “Private Railway”. And put at the Asakusa (Tobu/subway) at “From” and Tobu-Nikko at “To”. You will find the route which you need. I’m planning a weekend trip from Tokyo to Nikko from 13-15Apr, staying two nights in Nikko. My main area of interest is hiking to see beautiful scenery in Nikko like around Lake Chuzenji area and I plan to book a hotel near the lake. In Tokyo, I’ll be staying at Westin Tokyo. There are so many ways to get to Nikko you have shown us but based on what I plan to do, could you recommend me the best way to travel from Tokyo to Nikko (which station?) and what type of pass should I get, if any? This pass covers all part of your trip plan. But you have to pay extra if you take a limited express train to Nikko. Otherwise you have to take an ordinary train and you have to change trains once or twice between Asakusa and Nikko. Can you please assist me on what JR Rails I can access from my hotel at Super Hotel Lohas, Akasaka, Minato, Tokyo to Nikko Japan? I plan on doing a day trip to Nikko as part of my family vacation and to have my daughter see snow for the first time. My reservations are from Dec. 26, 2018 to Jan. 3, 2019, so if there are other options to see snow that is closer during this time period, can you please recommend? I thank you in advance for all your assistance. If you meant that you will use JR pass or other JR deals, you can take Shinkansen (Tokyo-Utsunomiya) and Nikko line (Utsunomiya-Nikko). You have to take subway to get Tokyo station which is not covered by JR pass. I cannot guarantee to see snow in Nikko. If you go to Gala Yuzawa, you can see snow. You can get there as day trip from Tokyo. I have a pasmo and suica card with me and my wife and have a good enough balance. 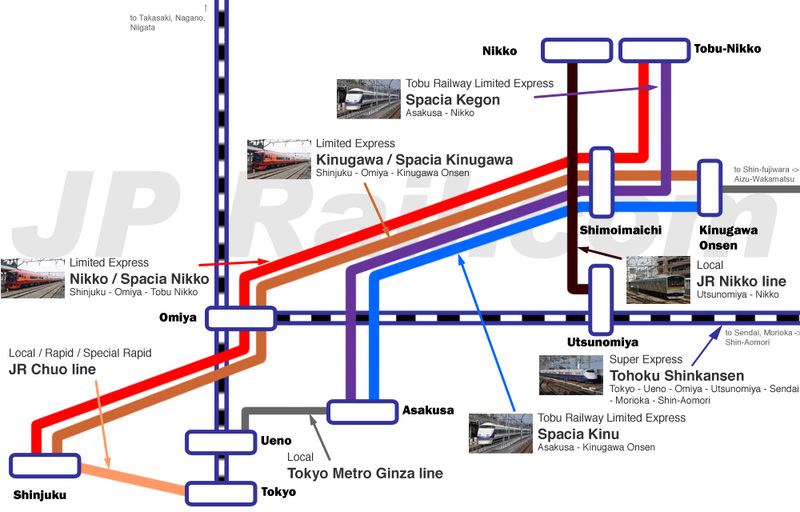 We plan to go from ASAKUSA(TOBU/SUBWAY) to SHIMO-IMAICHI via rapid train. Can pasmo and suica cards balance be used at this line ? After that, by buying NIKKO PASS ALL area, can it be used for above rapid train or is it for travelling/transit in Nikko area only ? You can use Pasmo or Suica to take train from Asakusa to Shimo-Imaichi. But if you use Nikko Pass, it includes Asakusa – Shimo-Imaichi round trip. Suica or Pasmo is not required. If you meant you want to take Limited Express train and want to pay surcharge by Suica or Pasmo, you cannot. Suica or Pasmo can be used for base fare only.